Hello my name is Perry Anderson and I specialize in custom wooden jigsaw puzzles and custom wedding guest book puzzles. I have been an woodworker since my childhood almost 25 years ago, and began working professionally since 2010. Though I started my career focusing on custom furniture, I soon realized that I had found my niche with custom wooden jigsaw puzzles. Over the past few years I have continually worked on my craft as a puzzle maker, and now I almost exclusively manufacture wedding guest book puzzles. I currently average around 100 such puzzles each year, and am always touched when someone lets me be a part of their wedding day! Please feel free to contact me at anytime, or read below to learn more about my puzzle offerings. If you are looking for a unique wedding guest book idea, then consider an Anderson Woodcrafts custom guest book puzzle. All of my wedding guest book puzzles are handcrafted, and may be made with an image that you provide or left blank for future framing. Individual pieces measure 2"x2" which is an optimal size for your guests to sign and even leave a brief personalized message. View Wedding Guest Book Puzzles! Wooden jigsaw puzzles have been around for centuries, with the first known puzzle being crafted in London around 1760. 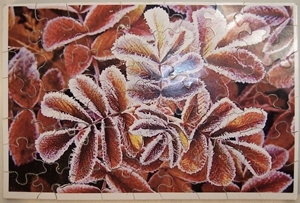 For a little more than 100 years, jigsaw puzzles were made from wood, and often displayed a hand painted image. As jigsaw puzzles gained popularity, in the late 1800's manufacturerers began making cardboard puzzles in order to keep up with demand. Today, the market is still dominated by these mass produced cardboard puzzles and very few handcrafted wooden jigsaw puzzle makers remain. For puzzle enthusiasts however, nothing can compare to the tactile weight and feel of a wooden puzzle. All of my wooden puzzles are completely made to order, and custom pieces (called figural pieces ) may be cut into your puzzle to add a highly personalized look. 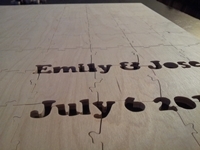 Examples would include the name of a bride and groom, or the date of a wedding for guest book puzzles. My smaller more traditional jigsaw puzzles could include the recipient's name or a special shape that holds significant meaning.